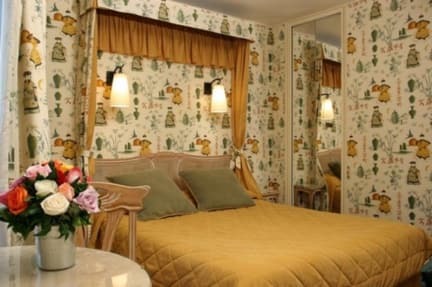 Neuilly Park Hotel Porte Maillot, Paryż, Francja : Rezerwuj teraz! 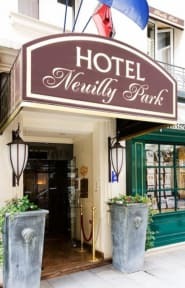 Nestled in the prestigious quarter of Neuilly sur Seine (porte Maillot), only five minutes away from the Champs Elysees and the Palais des Congres, Neuilly Park Hotel is a magnificent and charming boutique hotel. You will be seduced by the uniqueness, refinement and excellent comfort of this hotel. With only 30 rooms in total, each on has been decorated with a different theme in which originality crosses with elegance and refinement. Some of the themes to be discovered in this hotel are the Andalusian, the Mandarin, the Sahara, the Japanese, the Love room or even the American Indian rooms. The breakfast at the hotel is the perfect way to say hello to the day, with a genuine Parisian 'cafe croissant' or a cold buffet. The decor throughout is warm and will make you feel right at home. This beautiful establishment is an ideal location for customers in search of entertainment and haute-couture boutiques following in Parisian tradition. All our rooms feature WIFI.